© Zubaid et al. ; Licensee Bentham Open. To describe the risk profile, management and one-year outcomes of patients hospitalized with acute coronary syndrome (ACS) in the Gulf region of the Middle East. The Gulf locals with acute coronary syndrome events (Gulf COAST) registry is a prospective, multinational, longitudinal, observational, cohort-based registry of consecutive citizens, from the Gulf region of the Middle East, admitted from January 2012 to January 2013 to 29 hospitals with a diagnosis of ACS. Data entered online included patient demographics, cardiovascular risk profiles, past medical history, physical findings on admission, in-hospital diagnostic tests and therapeutic management, as well as one year outcomes. 3188 patients were recruited. The mean age was 60.4 &#x0026;#x00B1; 12.6years (range: 22-112), 2104 (66%) were males and 1084 (34%) females. The discharge diagnosis was ST-segment elevation myocardial infarction (STEMI) in 741 (23.2%), new-onset left bundle branch block myocardial infarction (LBBBMI) in 30 (0.9%), non-ST-segment elevation myocardial infarction (NSTEMI) in 1486 (46.6%) and unstable angina in 931 (29.2%). At hospital presentation, 2105 (66%), 1779 (55.8%), 1703 (53.4%) and 740 (23.2%) had history of hypertension, dyslipidemia, diabetes mellitus and active smoking, respectively. Patients with ACS in our region are young with very high risk profile. The Gulf COAST registry is an example of successful regional collaboration and will provide information on contemporary management of ACS in the region. Keywords: Acute coronary syndromes, Gulf, Middle East, registries.. Acute coronary syndrome (ACS) is a common manifestation of cardiovascular disease and its recognition with appropriate treatment impacts patient mortality and morbidity . To date, there are no data on one-year outcomes of unselected Middle East Gulf citizens with ACS. The main aims of Gulf COAST were to: a) determine the clinical risk profiles of citizens with ACS, b) describe the practice of physicians involved in the care of ACS patients, and determine the level of adherence to evidence-based guidelines, c) determine patient reported behavioral changes after ACS (e.g. smoking cessation, adoption of exercise, return to work and return to pre-illness sexual activity), and, d) describe 12 months morbidity and mortality outcomes for these patients.The results will provide valuable insight to identify care gaps for healthcare providers and policy makers in the region, and act as foundation for future quality improvement initiatives. The Gulf COAST registry is a prospective, multinational, longitudinal, observational, cohort-based survey of all consecutive citizens who were admitted to hospitals with a confirmed diagnosis of ACS. Enrolment started in January 2012 and ended in January 2013. The Ethics Committees of each participating institution or country approved the study protocol.The current report presents the registry’s design, methodology, rationale, protocol implementation and patients’ baseline characteristics. The Gulf COAST registry adhered to the recommendations of “Strengthening the Reporting of observational studies in Epidemiology (STROBE)” . To provide findings that are representative of the involved countries, > 85% of the general hospitals in each country were included. The registry recruited patients from 29 hospitals in 4 Middle East Gulf countries: Kingdom of Bahrain (Bahrain): 2; State of Kuwait (Kuwait): 6; Sultanate of Oman (Oman): 12; and United Arab Emirates (UAE): 9.Of the 29 participating hospitals, 14 were community hospitals, 18 non-university teaching hospitals and 1 private sector hospital. All of the hospitals had on-site thrombolytic therapy available. On-site cardiac catheterization was available in 9 of the hospitals, while another 10 had a cardiac catheterization laboratory available to them within 1 h drive. Asteering committee from regional experts in the field was formed. A registry manager was appointed to coordinate between the national coordinators (NC), chief site officers (CSO) and site officers (SO) in the 4 countries. The protocol and the case report form (CRF) were drafted by the primary investigator and the study manager, and reviewed by the steering committee. Prior to the commencement of enrolment, one steering committee meeting and one investigators meeting were held. In addition, country-level and hospital-level meetings were held by the NCs in their respective countries. These meetings involved CSOs and SOs to educate them about the protocol and CRF. The CSOs supervised recruitment to ensure it was consecutive and helped answer data queries generated for their sites. The SOs recruited patients, and filled out CRFs prospectively at admission time and during hospital. Later on, they transferred the data online at their earliest convenience either from the workplace or other locations, depending on whether or not internet service was available at the hospital. Patients enrolled in the registry were citizens, 18 years of age or older with ACS diagnosed according to American College of Cardiology (ACC) clinical data standards .The decision to enroll citizens only was determined by the need to have near complete follow up of the study population.The expatriate population come from different countries, they are young, mostly male and highly mobile. This made it hard to guarantee their availability for follow up at 1 year. In addition, citizens are relatively homogenous in terms of their lifestyle, standard of living and access to free universal health care. There were no other exclusion criteria, and an attempt was made to recruit all comers. Patients were enrolled only after obtaining written informed consent to participate in the study. Patients who were eligible for inclusion in the registry but were not recruited for any reason (e.g. refused consent, died before consent) were entered into log sheets that recorded their age, gender, diagnosis and reason for not beingenrolled. Data were prospectively collected on a standardized case report form (CRF). Data variables were in accordance with ACC key data elements and definitions for measuring the clinical management and outcomes of patients with ACS . Data collected included patient demographics, previous diseases and risk factors, prior medication,clinical presentation, management during hospital stay including medications, reperfusion therapy and procedures, outcomes and discharge medications and follow up arrangements. Follow up was planned at 1, 6 and 12 months from the date of enrolment. Follow up was carried out by clinic visit or telephone interview. Data entry was carried out by SOs online at www.gulfcoastregistry.org. A feature of the online data entry system included immediately-displayed automated data checks for out-of-range values and missing values of single data fields and also contradictory entries related to multiple data fields. In addition, throughout and at the conclusion of the study,to ensure accuracy of data, the registry manager carried out data cleaning using IBM® SPSS® Statistics 19 Program. A clinical research associate carried out site visits which included a visit to all participating hospitals at least once and involved random data source verification of 10% of paper and electronic CRFs at each visit. In determining the sample size for Gulf COAST, we considered practical and statistical inputs. Practically, we weighed both logistical and funding issues including the number of citizens with ACS we expect to enroll from the participating centres over the planned enrolment phase.This was informed by prior experience with a large ACS registry of all comers in the Gulf Registry of Acute Coronary Events (Gulf RACE), where approximately 2500 local patients with ACS were enrolled over a 6-month period . Hence, we can expect to comfortably enroll ~ 5,000 patients from the same centers over a 12-month enrolment period. Statistically, we recognize the difficulty in estimating sample size in an observational registry where several variables will be measured and no primary comparisons are planned. Nonetheless, we wanted to ensure adequate precision in the estimate of one-year all-cause mortality among locals presenting with ACS. 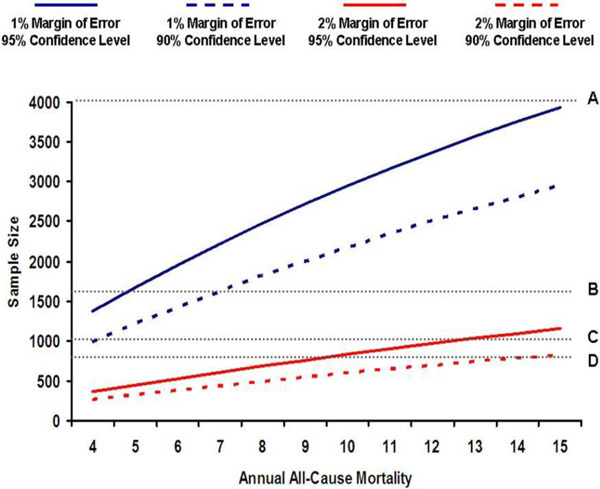 To estimate an annual mortality rate of 10% at 1 year with a margin of error of 1% and 95% confidence intervals, a sample size of 2,948 patients is required. However, since there is little guidance in the literature on annual mortality of Gulf citizens with ACS, and also to compensate for losses of follow-up, we adjusted our sample size upwards to 4,000 patients. As shown in Fig. (1), a sample size of 4,000 will provide adequate precision in estimating annual mortality over a reasonably wide range of event rates, and is logistically feasible given our prior experience . We also considered the precision of all-cause mortality estimates for the following subgroups: ST-segment elevation myocardial infarction (STEMI), women, and patients younger than 50 years. Based on observations from Gulf RACE . We estimate that 20% of citizens with ACS will have STEMI, 40% will be women, and 25% will be younger than 50 years. Therefore, for a total sample size of 4,000 patients with ACS, we expect 800 patients with STEMI, 1600 women, and 1000 patients younger than 50 years. These numbers will allow us adequate precision around all-cause mortality estimates for these subgroups with at least 90% confidence and, at most, 2% margin of error. Baseline hospital and patient characteristics were summarized using standard descriptive statistics.Continuous variables were summarized using means and standard deviations, where the distributions were normal or near normal, or medians and 25th/75th percentiles otherwise. Categorical variables were summarized using percentages. Of 3188 patients, 1194 (37.5%) were recruited from Oman, 975 (30.5%) from Kuwait, 610 (19%) from UAE and 409 (13%) from Bahrain. The distribution of discharge diagnoses were as follows: non-ST-segment elevation myocardial infarction (NSTEMI): 1486 (46.6%), unstable angina: 931 (29.2%), STEMI: 741 (23.2%) and new-onset left bundle branch block myocardial infarction: 30 (0.9%). The mean age was 60.4 ± 12.8 years. Table 1 shows the patients’ characteristics. Baseline characteristics of patient population. LBBB MI: left bundle branch block myocardial infarction; NSTEMI: non-ST-segment elevation myocardial infarction; STEMI: ST-segment elevation myocardial infarction; ACE: angiotensin converting enzyme; ARB: angiotensin receptor blocker; GPIIb/IIIa inhibitor: glycoprotein IIb/IIIa inhibitor. Past medical history and CV risk factors. TIA = transient ischemic attack; PCI = percutaneous coronary intervention; CABG = coronary artery bypass graft. Findings on physical examination at first presentation. BP: blood pressure; BMI: body mass index; ECG: electrocardiogram; LBBB: left bundle branch block. The population risk profile included hypertension: 66%, dyslipidemia: 55.8%, diabetes mellitus: 53.4% and current smoking: 23.2% (Table 2). At presentation, the mean heart rate was 85.6 ± 21.3 beats/min, mean systolic blood pressure was 141.3 ± 28.2 mmHg and mean diastolic blood pressure was 80.7 ± 16.5 mmHg. Three-quarters of the patients were over weight or obese (Table 3). TIA = transient ischemic attack; PCI = percutaneous coronary intervention; CABG = coronary artery bypass graft. 89 patients (59%) or not being approached by investigators: 62 patients (41%). Per country, the failure to enroll was 1.5% for Bahrain, 3.2% for Oman, 6.4% for Kuwait and 7% for UAE. The Gulf COAST registry is the first prospective registry from the region focusing on citizens suffering from ACS with a planned long-term follow up. The baseline characteristics of citizens with ACS in the Gulf region of the Middle East were described in this report. The age of our patients was much younger compared to published Western data [6, 7]. Nevertheless, we found they had high cardio-metabolic risk burden in the form of overweight and obesity, diabetes mellitus, hypertension and smoking. Registries have fewer exclusion criteria and consequently include a wider range of patients. Therefore, observational prospective patient registries like ours complement randomized trials by providing evidence derived from a different type of study methodology . Compared to randomized trials, well-conducted registries have the benefit of providing a representative “real-world” view of both clinical practice and patient outcomes provided that investigators ensure high-quality data with clear vision regarding the strengths and weaknesses of the registry being conducted . The current registry will enhance our knowledge regarding ACS medical practices in the region in several ways. First,advances in practice made in 2012 can be compared with previous practice from 2007 . This will encompass many practice patterns, importantly the degree of adoption of primary percutaneous coronary intervention (PCI) in patients with acute STEMI. Second, it will provide important information about long-term outcomes of patients with ACS in the region. Third, Gulf COAST will, for the first time, provide data on social and lifestyle behavior of Gulf citizens after an ACS. Fourth, we plan to focus on the influence of risks such as diabetes and obesity that are common in our patients. Finally, the registry will enable us to compare practices between the 4 participating countries and its influence on outcomes, especially comparing the practice in Oman, a large country with lower annual individual income compared with the other 3 countries. We believe the subsequent analysis of all data and future publications from Gulf COAST will contribute to the existing literature and will contribute to better management of the ACS patient in the Gulf. We hope data from Gulf COAST would inform health care policy in the region and guide providers and regulatory authorities in their decisions regarding local and regional policy for cardiovascular care, from prevention to management and subsequent guideline construction. The data will provide local authorities with an insight into their local shortcomings which can translate into a quality improvement programs and policies. As with any observational study, the execution of the registry may be limited by selection bias, particularly the potential exclusion of high-risk patients. In order to minimize this bias, we introduced a log sheet that investigators complete for all patients who were not enrolled. Moreover, we acknowledge that citizenship and ethnicity are not synonymous. Hence, while citizens may have relatively homogeneous lifestyle and social status, there may be some ethnic heterogeneity that we did not account for. The strength of our registry comes from its design that included 4 different countries, participation of the majority of hospitals in each country and enrolment of all patients presenting to each hospital. Zubaid, Alsheikh-Ali, AlMahmeed speaking honoraria from Sanofi and BoehringerIngleheim and Astra Zeneca. We thank Professor Hasan Alsanad, Vice President for Research at Kuwait University, and Professor Haitham Lababidi, Assistant Vice President for Research at Kuwait University for their tremendous support and facilitation of Kuwait University sponsorship and oversight of this project. Gulf COAST is an investigator-initiated study that was supported by Astra Zeneca and Kuwait University (project code XX02/11). Neither Kuwait University nor AstraZeneca had any role in the study design, data collection, data analysis or writing the manuscript. Steering Committee: Mohammad Zubaid (Principal Investigator, steering committee chairman, Kuwait), Wafa Rashed (Registry manager, National Coordinator, Kuwait), Mustafa Ridha (Kuwait), Fahad Alenezi (Kuwait), Rashid Alhamdan (Kuwait), Mousa Akbar (Kuwait), Najib Alrawahi (National Coordinator, Oman), Haitham Amin (National Coordinator, Bahrain), Wael Almahmeed (UAE), Alawi Alsheikh-Ali (Registry statistician, UAE), Abdullah Shehab (National Coordinator, UAE), Husam Ouda (UAE), Abdullah Alnuaimi (UAE), Fahad Baslaib (UAE), Arif Al-Mulla (UAE) and Harlan Krumholz (USA). Bahrain: Bahrain Defense Hospital: Leena Sulaibikh*, Babu Thevan, Dev Sheel, Fahimuddin Sayed, Fawaz Bardooli, Hugmi Jain, Jasim Mohammed, Manal Matar, Rajesh Jayakumar, Sanjeev Kumar Jaiswal, S Mushtaq Sayed, Vinayak Vadgaonkar. Salmaniya Medical Complex: Taysir Garadah*, Khalid Bin Thani*, Aisha Al-Moosa, Alaa Al-Zamrooni, Mohamed E. Alalawi, Eman Murad, Fajer Al-Moosa, Aziza Matooq. Kuwait: Adan Hospital: Sadiq Abdul*, Abdel aleem Rabie, Ahmed Nabil Hassan, Ahmed El Mugharbil, Sherif Arafat. Ahmadi (Kuwait Oil Company) Hospital: Shahid Zubair* Chest Hospital: Medhat Soliman*, Mohamed Farouk Elkhalifa, Mohamed Ali Sallam, Viji Koshy George. Farwaniya Hospital: Amr Elguindy*, Ahmed Amin, Ayman Abdel Mawgoud, Emad Nashaat, Mahmoud Abdel Tawab, MiladRafla, Mohamed Okba, Mousa Arafat. Jahra Hospital: Mohammad El Gindy*, Melek Atta, Mustafa Alshaikha, Rim Ahmed. Mubarak Hospital: Ibrahim Farrag*, Abdulmonem Mohamad, Ashraf Hammad, FawzyMaqlad, GladisHefny, Hani Bassiouny, IhabAwwad, Maged Youssef, Motaz Elarini, Nabil Ragab, SamehElmasry, Samir Mohamad. Sabah Hospital: Islam Elsisy*, Mahmoud Korashy, Simon George. Oman: Armed Force Hospital: BR Kamath*, Bichu Ruchir Kumar. Bahala Hospital: Kurian Mathew*. Burami Hospital: Naguib Asham Zaki*. Ibri Hospital: BimalChakroborty*, Abdalla Abdalla, Ayman Aziz, Nipa Saha, Yaseer Khan. Nizwa Hospital: Mourad Al Sharkawy*, Abdel-Salam Gamil, Abubaker Ahmed, Ahmed Abdulla Elamin, Ahmed Nidham Nidham, Amjad Saeed Merghani Hammour, Azhar Al-shaibany, Bahaa Eldin Mohamed, Fahmy Hilal, Imadeldin Mohammed Alhaj, Mahmud Hassan, Mohamed Ebrahime, Sabah Al Saeedi, Emad Salah Fathy, Ahmed Hegazy. Royal Hospital: Mohamed Al-Riyami*, Amir Al-Amri*, Wadhha Alsiyabi, Hany Samir. Royal Police Hospital: Abdul Malik*, Renchi Mathew. Rustaq Hospital: Osama Alkadi*, AlaaElmeligy, Mian Nasirud Din. Sohar Hospital: Aouf Mohamad Alazzawi *, Ali Al-Khafaji, Hamada Mohamed Amin, Hatim Issa, Jan Gorgy, Mohamed Abdulraheem, Salma Jabeen, Sameh Girgis, Sheshadri Pasupathy. Sur Hospital: Qassim Shimal*, Ganesh Vimal, Sumail Hospital: Safwat Abdel Wahab*, Ahmed Mosad Ibrahim, Manal Sabry Mohamed. Sultan Qaboos Salalah Hospital: Prit pal Singh*. Roger VL, Go AS, Lloyd-Jones DM , et al. American Heart Association Statistics Committee and Stroke Statistics Subcommittee.Heart disease and stroke statistics-update a report from the American Heart Association. Circulation 2012; 125: e2-e220. Von Elm E, Altman DG, Egger M , et al. The strengthening the Reporting of Observational Studies in Epidemiology (STROBE) Statement guidelines for reporting observational studies. Bulletin of the World Health Organization 2007; 85: 867-72. Weintraub WS, Karlsberg RP, Tcheng JE , et al. ACCF/AHA 2011, key data elements and definitions of a base cardiovascular vocabulary for electronic health records a report of the American College of Cardiology Foundation/American Heart Association Task Force on Clinical Data Standards. J Am Coll Cardiol 2011; 58: 202-22. Zubaid M, Rashed WA, Al-Khaja N , et al. Clinical presentation and outcomes of acute coronary syndromes in the gulf registry of acute coronary events (Gulf RACE). Saudi Med J 2008; 29: 251-55. Zubaid M, Rashed WA, Almahmeed W , et al. Management and outcomes of Middle Eastern patients admitted with acute coronary syndromes in the Gulf Registry of Acute Coronary Events (Gulf RACE). Acta Cardiol 2009; 64: 439-46. Steg PG, Goldberg RJ, Gore JM , et al. Baseline characteristics, management practices, and in-hospital outcomes of patients hospitalized with acute coronary syndromes in the Global Registry of Acute Coronary Events (GRACE). Am J Cardiol 2002; 90: 358-63. Mandelzweig L, Battler A, Boyko V , et al. on behalf of the Euro Heart Survey Investigators.The Second Euro Heart Survey on acute coronary syndromes characteritics treatment and outcome of patients with ACS in Europe and the Mediterranean Basin in 2004,. Eur Heart J 2006; 27: 2285-93. Gliklich RE, Dreyer NA, Eds. Registries for evaluating patient outcomes a user’s guide.2nd ed. (Prepared by Outcome DEcIDE Center [Outcomes Scinces Inc d/b/a Outcome] under Contract No. HHSA2902005,00351T03.) AHRQ Publication No. 10-EHC049. Rockville, MD Agency for Healthcare Research and Quality; September . 2010. Bufalino VJ, Masoudi FA, Stranne SK , et al. American Heart Association Advocacy Coordinating Committee.The American Heart Association's recommendations for expanding the applications of existing and future clinical registries a policy statement from the American Heart Association. Circulation 2011; 123: 2167-79.